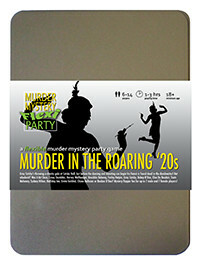 You've been invited to play the role of BOOBOO B’DOO in Murder in the Roaring '20s. Gray Catsby has invited his most talented and wealthy friends to a charity gala event at his countryside residence, Catsby Hall. But before any dancing and donations begin, Catsby’s fiancée, Ginger Whiskers, is found dead in the dumbwaiter! Join the flappers and dappers to find out who finished her off! Long satin gloves, sparkling headband, and a necklace of pearls complement the blue evening gown you wear to sing. Don’t forget your microphone! Your parents really did try to stop you singing incessantly as a child but to no avail. It was so bad they had to save up so you could have singing lessons, but that paid off later in life when you became a cabaret performer and landed a role as Marietta in the operetta Naughty Marietta. You teamed up with Bebop after responding to his advert for a singer in the local paper and, although you’d set your sights on Broadway, you fell head over heels and have followed Bebop ever since. I’m Booboo B’Doo - singer, songwriter and all-round good-time girl. It was such an honour to be performing at Catsby Hall, but now this terrible event has clouded the evening. When Bebop said he was off for a walk, I decided to fix my make-up in the ladies room downstairs. That’s where I was when Ginger was killed. It’s a good thing too - I hate the sight of blood. And it always takes so long to wash it off, don’t you find?